Bishnu and I are running another Colourful Journey in March next year. It’s prompted me to look at old photos and emails. Thought it might be fun to share some reflections from the archives!! This was written while I was living in Dharan, Sunsari some time between 2007 and 2011. Staring is not the national pastime of Nepal. That would be chatting. But I am sure staring is up there on the list of top ten activities. And I love it. It is a delight to live in a country where a frankly curious and interested stare is not considered rude, and generally returned. Both the starer and the staree are connected in this very honest, human moment. 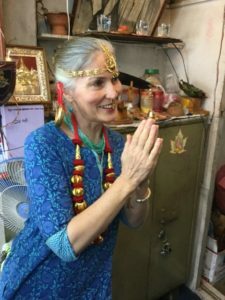 As one of the few Westerners here in Dharan, for a while the newest, and one of the more bejeweled, I initially wondered what I could do to make myself less interesting (less stared at). Eventually I realised that the answer was…absolutely nothing. No matter what I wore, didn’t wear, bought, didn’t buy, laughed at or didn’t laugh at, I was stared at. And it was so liberating. yield to my sari fetish and finally live out my life’s motto of Too much jewellery is never enough. And my Nepali friends love it. Rarely a day passes when the fact that I am wearing what just about every other women here is wearing, doesn’t get a thumbs up or a delighted Kati ramro (how good). My jewellery is admired and handled and the fact that it matches what I wear praised incessantly. For the exhibitionist princess* within, this is heaven. Only my lack of a permanent nose ring, bulanki and the small red tikka on my forehead causes minor but understanding concern. Most assume it is only a matter of time. The other really liberating thing is that now I CAN STARE BACK! And here, there is such a wealth of staring opportunities. I can stare at the magnificent hill women with their intricately patterned lunghis (sarongs) and riotously mismatched T-shirts; their complicated bath towel head-dresses and their myriad gold earrings and nose rings-connected with wonderful ornaments. How they can kiss is beyond me but given dental hygiene sometimes that may not be a problem. I can tell them how I adore the cacophonous combination of colours, the intricacy of their necklaces, the celebratory rustling of their bangles. All with a Kati ramro and a nod in the right direction. I can stare at the Tibetan ladies with their leathery wizened faces, massive coral necklaces and well worn silk shirts as they sell small bags of ground yak horn, desiccated zopko dung, shriveled sheep’s testicles or whatever it is they sell. 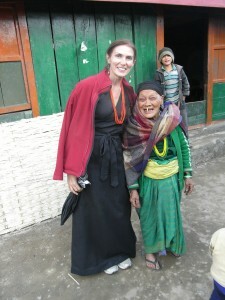 I can return their smiles when they see me in my angi (Tibetan dress) and laugh at how ridiculous I look! I suspect they think I look pretty ridiculous whatever I wear but I know they think I look less ridiculous when it is like them! I can stare at the tiny, nimble hill men in their jodhpurs and topis (caps) and wonder how they manage to put their massive khukri knives down the front of their pants without threatening their manhood. In my experience, the best way to end a stare is to smile openly and Namaste garne-say hello. It is the end of a stare and the beginning of a conversation. *Even introverts can have exhibitionist princesses within. The jewellery is this last shot is poised precariously rather than permanently installed. Silver hair gets even more attention! This entry was posted in Uncategorized on February 7, 2017 by wendy. Namaste Wendy. How lovely to read all that wonderful detail, this is like a juicy taste of Nepal and a great reminder of all the exuberant life and colour we enjoyed on the Colourful Journey you and Bishnu led us on. Kati ramro!! Thank you for sticking with this sporadic blogger Deb. Feast or famine eh!!! Big hugs. So good to hear from you Pam and I will email separately. Sounds like you are doing some fabulous travels!!! Thanks for sticking by on the blog so patientlY!! !